The Who’s John Entwistle passed away 16 years ago today. Here is a post that our friend Nick Scelsi wrote for CRRK 3 years ago. Thought we would repost it today. John Entwistle never much cared for the “big band” version of the Who that toured America in 1989 and 1996/97. With as many as 15 to 18 musicians onstage (including the Who’s three surviving original members), they performed as a kind of watered down, largely acoustic and relatively low-volume tribute to their former selves. “The Who on Ice,” as Pete Townshend wryly described it. But lately, things had begun to change. In 2000, with Townshend returning to playing electric guitar full time, they toured with a stripped-down five-man lineup for the first time since 1982, and with their explosive performance in the wake of 9/11 at The Concert for New York proving they were still capable of rising to any occasion, ticket sales for their upcoming 2002 tour were brisk. The tour, which Townshend has said he agreed to do only as a way of helping Entwistle pay off his massive debts, was scheduled to open in Las Vegas. John Entwistle died in the arms of a “good-time girl” in Room 658 at the Hard Rock Hotel and Casino on June 27, 2002, one day before the tour was scheduled to begin. He was just 57 years old. The Clark County medical examiner determined the cause of death to be a cocaine-induced heart attack. Despite the Who’s legendary “the show must go on” reputation (they once had allowed an audience member to fill in on drums for a passed out Keith Moon rather than stop the show), even some of their most ardent admirers were shocked by the June 28 announcement that, while the first two shows of the tour would certainly have to be postponed, Entwistle’s death did not necessarily mean that the remainder of the tour would have to be cancelled. Fans were advised to hold onto their tickets and wait for further news. They didn’t have to wait long. On June 29, Welsh bassist Giuseppe Henry “Pino” Palladino, who had worked on some of Townshend’s solo projects, but who was best known for his association with Paul “Everytime You Go Away” Young, was announced as John’s replacement. After only two days of rehearsals, the Who’s concert at the Hollywood Bowl went on as planned on July 1, 2002, four days after the death of the only bass player they’d ever known in their 38-year career. Here’s something I’m sure we’ve posted before, but it never fails to amaze. If nothing else, it shows just how large a contribution John made to the Who, and also how large a void was left in his absence. We proudly present “Ox Cam.” This was a bonus feature on the 2003 DVD reissue of The Kids Are Alright. 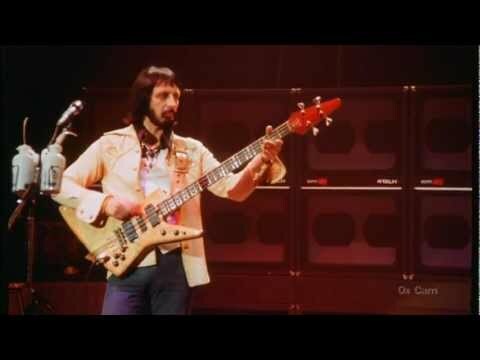 It’s John’s isolated bass track from a 1978 live performance of “Won’t Get Fooled Again” (there’s also one for “Baba O’Riley”). The camera stays on John the whole time. For 10 minutes, all you see, and all you hear, is The Ox.